Sam, our Border Collie pup, is learning very well. He is having to learn patience. Patience and Border Collies are not always friends! Often times, he wants to be patient, but just wiggles all over from anticipation. Here, he is learning to take the horses to the gate, but then sit watch and wait, until I close the gate. Oh yeah, and no chasing beyond the gate! I have been hanging out at my Amish buddy’s repair shop. We have been working on another project of mine. That project is almost done too. I, just like Sam, have been having to be patient as the project nears completion. Also , just like Sam, I am almost wiggling with excitement. Photos and a post coming soon about this new project. In my waiting and watching in the repair shop, I have learned a few new things. I am amazed at how the entire shop runs from a line shaft. This old method of powering machinery is a lost art among us “Yankee” folks, but is alive and well among my Amish friends. A motor turns a series of pulleys. The pulleys, once engaged, turn shafts that operate machinery like lathes, end mills, hacksaws and drill presses. I watch with my head almost on a swivel, as belts change directions and are slowed or sped up by gear reduction. Small magnetic switches engage small clutches to turn a machine on or off. I am blessed, to not only be able to watch these machines work, but also to be able to ask questions about how they work. My friend will take a few minutes to explain things to me. Our weather is unseasonably cold. The cold and freezing temperatures have delayed the maple syrup season. I am using the time to complete items on my “bucket list”. The things getting checked off the list, make waiting easier. The recently completed dump wagon was one of these projects. The good thing is that I can learn something new while I wait. Yesterday, we had a group of home schooled children come an visit our maple syrup operation. The kids had a great time running and playing in the woods and on the sap paths. They also learned a lot about all things maple. The field trip was organized by my daughter-in-law. She taught the group, gave out informational handouts and set up a tasting station. The steam was really rolling as I boiled maple sap for over six hours. The syrup is light, clear and delicious. In the afternoon the trees started to drip, but clouds and cool soon stopped that effort. Today we are cold and snowy. All of us get a break. I will do a little clean up and make ready for the next warm day and the sap flow that comes with it. It was fun for me to share with the visiting families. Moms, dads and kids alike all took some maple information home in their hands, as well as, in their minds. The steamy room, the sweet smelling syrup and the hot fire, all made memories….for us all. My dog Cinch had a great day too. All of those kids to play with and all that mud to splash through! He and I are grateful for the down time today. It was a fun day for us all as we bridged the gap from city to country, neighbor to neighbor and young to old. The best part of all, was making friends out of strangers! Summer Fun? You Better Hurry! Connie and Cinch play an almost daily game as she waters her flowers. 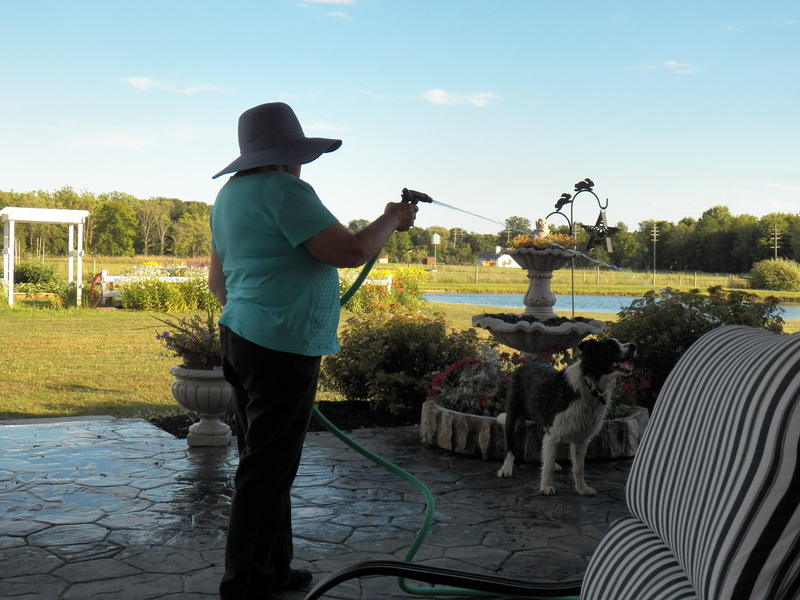 Cinch loves to “chew” water from a hose. I caught the two of them playing in the water the other day and snapped this picture. He jumps at the water and gobbles up huge mouthfuls. He is funny to watch and I admit, I have to play with him too as I fill water troughs around the farm. Summer is flying by these days. It’s hard to believe that the county fair is next week and school for children starts soon after. When I was a boy in 4-H, the county fair was the highlight of our summer. It was where we met up with old friends, rode rides and ate “food” from the midway. It was also a time for great responsibility. We had to care for, then show our animals. Unlike the daily care at home, we tended our stock 24/7, making sure city folks saw as little manure as possible. We worked hard, lost sleep and fell in love, always with a farm animal nearby. I never out grew it. I am the most comfortable around animals. They are my passion. They put me at ease…no matter if I am working hard or tired from lack of sleep. As for falling in love, it still works! I fell in love for the last time, thirty years ago, but I continue to fall in love with new babies, boy and girlfriends of grandchildren and people who God puts into my life, always with a farm animal nearby. The end of the fair week was bittersweet. It signaled the end of summer. It meant saying goodbye to friends from other school districts until next year. It meant saying goodbye to an animal friend raised and shown for it’s carcass. It meant school was just around the corner and the only thing to look forward to was mowing the yard. So, this time of year meant cramming as much summer fun into each day as possible. I still live by this creed. So, if you find me squirting water at my dog, you’ll know that I am just reliving the wonderful days of my childhood! My dog Cinch goes everywhere that I go. He runs back and forth as I go to the field. He waits by the gate while I work. He sits at my feet or lays nearby. If I move, he is going too. I could not ask for a better canine companion. He loves to ride in my truck, even if it is only for fifty feet. He will nudge my hand once in a while, but is not a pest. We are fast friends who look out for each other. 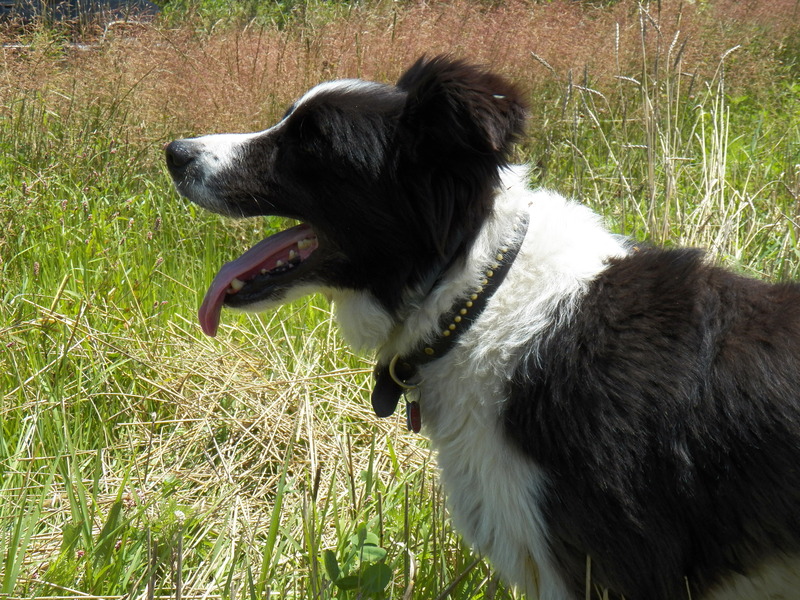 Lately, with all the farm work, we have made hundreds of trips to the fields and back, or at least it seems that way 😮 In every instance Cinch is with me….panting like mad. Today it is hot and dry. The straw is drying in the sun and most farm creatures are laying in the shade. I let Cinch into the breezeway where it is cooler. He gets fresh water often but what quenches his fire best is a word of praise and a pat on the head. When I use the sickle bar mower, I keep Cinch in his kennel or in the breezeway. I don’t want an accident. When I was a boy, there were lots of farms with 3-legged dogs. Many farmers cut their hay with sickle bar mowers. The dogs would lay in the high grass or even jump at the sickle bar. The often fell victim to the sharp blades. I sure don’t want that to happen to my buddy! Panting dogs, sweating men and drying straw are three things that can be counted on today. It reminds me of a time not so long ago when two little boys followed me around whining, “it’s hot dad.” Dang I miss those days…………. Our sow herd is out on pasture. They seem to love that space. The have several wallows thanks to all of our recent rains. They munch clover and grass while rooting after who knows what. They rest in the shade, lay in the sun and romp and play whenever they want to do it. They feel no stress. They come when I call to eat grain, but mostly they just relax and enjoy the summer breeze as it cools their skin. 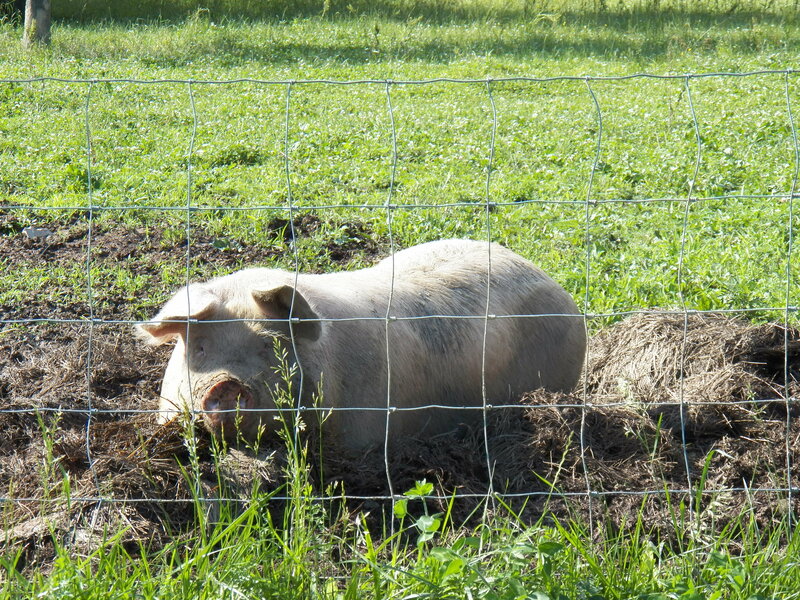 I have three mature sows, two bred gilts and a boar in a four acre pasture. The older gals will farrow in a month or so. The young gilts will not have babies until early October. I will let them all have their babies out on pasture. I do give them little hoop houses to use if they choose. Some will use them, but others will make a nest in a spot of their choosing and fill it with baby pigs. My fences are made from woven wire. The pigs are happy and not hungry. They stay where I put them because there is no reason to break out. When the grass gets short, I move the herd to another field. I give them grain daily, keeping an eye to not get them too fat. Fat mommas are lazy moms who will smash their babies, too lazy to jump up off a squealing piglet. Big moms are okay so long as they are fit. The walking and playing in my pastures helps keep them fit.